The name les fauves (‘the wild beasts’) was coined by the critic Louis Vauxcelles when he saw the work of Henri Matisse and André Derain in an exhibition, the salon d’automne in Paris, in 1905. The paintings Derain and Matisse exhibited were the result of a summer spent working together in Collioure in the South of France and were made using bold, non-naturalistic colours (often applied directly from the tube), and wild loose dabs of paint. The forms of the subjects were also simplified making their work appear quite abstract. Other like-minded artists associated with fauvism included Georges Braque, Raoul Dufy, Georges Rouault, and Maurice de Vlaminck. 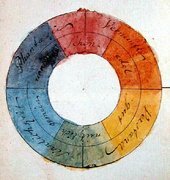 The fauvists were interested in the scientific colour theories developed in the nineteenth century – particularly those relating to complementary colours. Complementary colours are pairs of colours appear opposite each other on scientific models such as the colour wheel, and when used side-by-side in a painting make each other look brighter. Fauvism can be seen as an extreme extension of the post-impressionism of Van Gogh combined with the neo-impressionism of Seurat. The influences of these earlier movements inspired Matisee and his followers to reject traditional three-dimensional space and instead use flat areas or patches of colour to create a new pictorial space. Fauvism can also be seen as a form of expressionism in its use of brilliant colors and spontaneous brushwork. 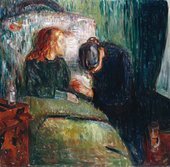 It has often been compared to German expressionism, which emerged at around the same time and was also inspired by the developments of post-impressionism. Although one of the first avant-garde modernist movements of the twentieth century and one of the first styles to make a move towards abstraction, for many of the artists who adopted a fauvist approach it became a transitional stepping stone for future developments in their style. By 1908 most of the main artists in the group had moved away from the expressive emotionalism of fauvism. A renewed interest in post-impressionist artist Paul Cézanne and the analytical approach he took to painting landscapes, people and objects inspired many artists to embrace order and structure instead. One–time fauvist Georges Braque went on to develop cubism along with Pablo Picasso while one of fauvism’s founders André Derain adopted a more conventional neoclassical style. 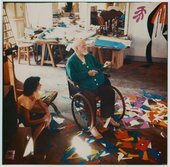 Henri Matisse however continued to use the distinctive fauvist traits of bright emotive colours, simple shapes and painterly mark-making throughout his career.